Updated Wednesday October 4, 2017 by SLL. 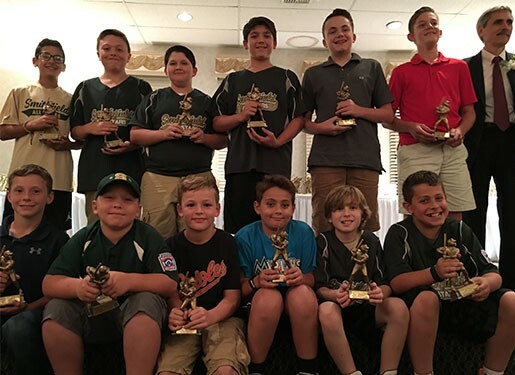 (BURRILLVILLE, R.I.)-At an awards dinner held Sept. 21 at Wright’s Farm attended by more than 250, Smithfield Little League recognized the 2017 division champions, all-stars and players who demonstrated the virtues of sportsmanship during the regular season. The league also recognized sponsors and other volunteers. The Sportsmanship Award recognizes the good character of a single player on each AAA, Majors and Junior League team throughout the league. Players chosen to receive this award have a great respect for the game of baseball, play a fair game, respect their opponent and demonstrate honorable behavior in winning or losing. The award was first established in 1973. Smithfield Lions Athletics, William Hawkins; Lombardo Sheet Metal Red Sox, Lucas Swierad; Laura's Diner Cubs, Connor Caprio; Sport Clips Rays, Alex Henson; and Barone Orthodontics Nationals, Chris Lopez. Colonial Toyota / Christiansen’s Dairy, Jacob Turbitt; Laura's Grill / Anderson Winfield Nathan Potter; and Greenville Inn / UCran CPA, Michael Catelle. Smithfield Little League congratulates those who have earned the distinct honor of receiving a sportsmanship award.